NBC 5 meteorologists said with temperatures remaining below freezing Monday night, slushy road conditions are only expected to refreeze and be worse Tuesday morning. NBC 5 Meteorologist Rick Mitchell announced the latest Winter Storm Watch issued for Tuesday night on Monday afternoon and confirmed it could produce both rain and snow, though mainly snow was expected from the Metroplex northward. A total of 1 to 3 inches of snow could fall by Wednesday morning. Get the latest information on the Winter Storm Warning from NBC 5 DFW Today beginning at 4 a.m. Tuesday. As the storm rolled in Sunday night, NBC 5 Meteorologist Rick Mitchell went for a ride in the new NBC 5 Texas Thunder Truck — our state-of-the-art storm chasing truck. 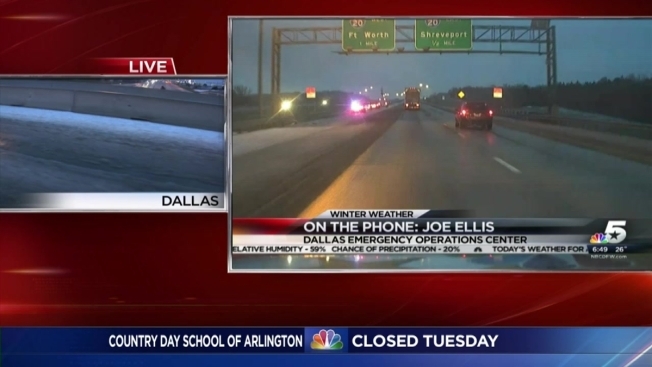 Live, over the air and online, as they drove in the storm, Mitchell was able to send live pictures from cameras built into the truck as sleet began to fall, coating North Texas highways. The Thunder Truck was put into service again Monday night, with Chief Meteorologist David Finfrock onboard as road conditions in North Texas continued to deteriorate. More than 700 schools and businesses reported closures to NBCDFW.com Monday and Tuesday. As of 9 a.m. Tuesday, 80 flights departing from and 88 flights arriving at Dallas/Fort Worth International Airport had been canceled. More than 20 flights out of and 33 flights into the airport were delayed. Six flights out of Dallas Love Field had been canceled as of 9 a.m. while 12 more were delayed. On Monday, more than 1,100 DFW Airport flights were canceled and nearly 300 more were delayed. Dallas Love Field reported more than 110 canceled flights and 50 delays. DFW Airport officials said roads throughout the airport and runways are open and in good condition Tuesday morning. Roads and runways will continue to be treated overnight. While the cause hasn't been confirmed, an American Airlines MD-80 taxiing to the terminal Monday night slipped off the taxiway and got stuck in the grass. At this time, no injuries have been reported. 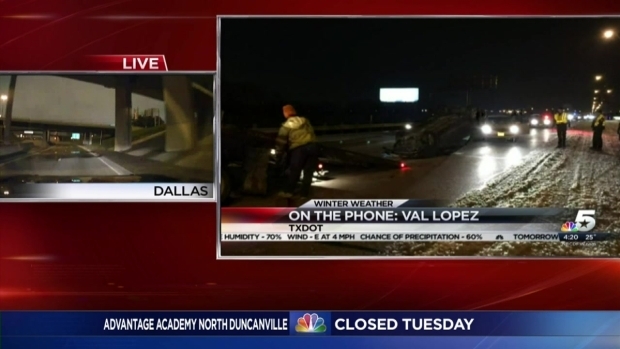 Val Lopez with the Texas Department of Transportation talks about the icy roads in North Texas. The driver of a big-rig was able to escape a crash that left his cab and trailer dangling off a bridge in Dallas Monday afternoon. The crash took place Monday afternoon along the northbound lanes of Interstate 45, near Simpson Stuart Road. Meanwhile, the North Texas Tollway Authority said it had nearly 100 trucks patrolling more than 90 miles of highways to apply sand or de-icer. The Texas Department of Transportation has been using 180 vehicles to treat icy bridges, overpasses and roads with a mixture of sand and salt. Graders are also ready to break up ice should it accumulate. In Dallas, police said between midnight and 4 a.m. they responded to 76 minor crashes, 41 injury crashes and 77 crashes on freeways. MedStar Ambulance said between 6 p.m. and 11:59 p.m. Sunday they responded to 51 crashes with injuries, one fall, one person treated for exposure and five pregnancy calls (likely from people who didn't want to drive on the ice). Since midnight Monday, they responded to 22 crashes with injuries, one fall, one person suffering from exposure and four pregnancy or childbirth calls. At 4 p.m., MedStar said they were currently responding to four calls during rush hour. Calls for service reports for other cities were not readily available. Why More Sleet Than Snow? 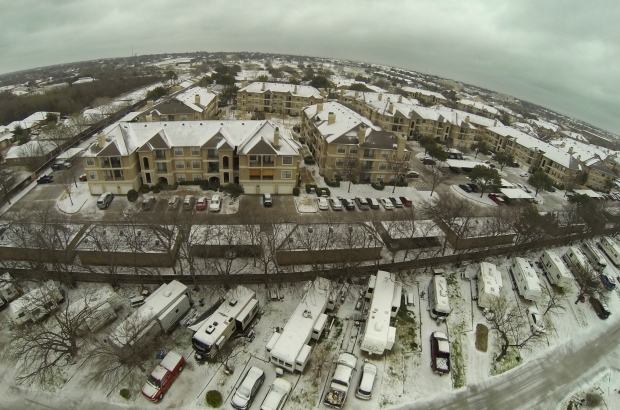 Meteorologist Grant Johnston discusses why we see more sleet than snow in Texas. Tens of thousands of electricity customers were affected by power outages Monday and Tuesday, Dallas-based utility Oncor reported. In Erath County, the weather delayed the trial of ex-Marine Eddie Ray Routh, charged in the shooting death of former Navy SEAL Chris Kyle, whose memoir, "American Sniper," was the basis for the Oscar-nominated movie. The trial is scheduled to resume Tuesday, weather permitting. NBC 5 has crews on the way and we'll update this story with more information as soon as it's available. As this story is developing, elements may change.